With any form of peripheral neuropathy, there can be significant symptoms including numbness, tingling, shooting pains, stabbing pains, or burning in the feet. Although no patient's story is exactly the same, if you are diabetic the associated peripheral neuropathy can greatly interfere with sleep and your overall lifestyle. Therefore, it is important to understand this common complication of diabetes, in order to determine how best to treat it. Diabetes is not the only cause of neuropathy. However, it is one of the most common causes of peripheral neuropathy in the United States. Symptoms of this polyneuropathy, usually present symetrically, in a stocking-glove presentation. Stocking-Glove Presentation: Because it presents in the feet first, starting at the big toe and then the hands, starting at the tips of the fingers, it is commonly described as a stocking-glove presentation. As the neuropathy worsens, symptoms will progress from the toes and fingers, to involve a good portion of the feet, legs, hands and arms. 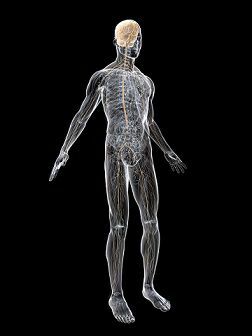 Polyneuropathy: Diabetic peripheral neuropathy is recognized as a polyneuropathy, becuase multiple different types of nerves are being affected. Malfunctioning of sensory and motor nerves, often manifest in symptoms of numbness, tingling, electrical shocks and shooting pains in the feet. If these symptoms are left untreated, they may lead to contracture of the digits, weakness or poor balance. If autonomic nerves are also involved, which they often are, the presentation of symptoms may also include dry, scaling skin because there is an insufficient oil release to the skin. There are many theories as to why diabetes causes neuropathy. However, the easy answer is the "sugar coating" of tissues. High blood sugar in a diabetic patient, causes the nerves to be covered in sugar (glycosolated), which in turn keeps them from being able to function properly. Although this is an oversimplificaiton of the problem, it is one that helps patients understand why the first treatment option for confirmed diabetic peripheral neuropathy is the managing of blood sugars. Managing your diabetes, through healthy eating habits, exercise and prescribed medications is always important, but it becomes even more crucial when it comes to treating diabetic peripheral neuropathy. Since high blood sugar has been proven to be one of the main causes of this type of neuropathy, the careful management of these blood sugars have also tends to reduce painful symptoms.